Ein Gedi - We Are Outdoorspersons! During Max' s break we did a whole lot of nothin'. It was quite nice actually. 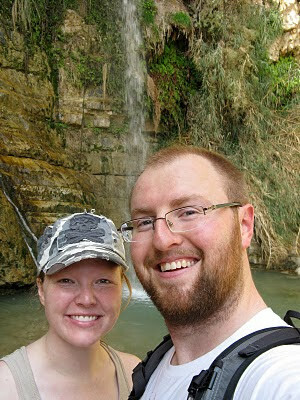 But we did take one trip to Ein Gedi - an oasis in the desert next to the Dead Sea. One of our "goals" for coming to Jerusalem was to become outdoorsy people. I grew up doing outdoorsy things with my family, but when I faced trying to convert my city husband, I found that it was easier to join in watching movies and eating out than wrestle up the motivation to go hiking or worse, camping. (To be fair, we are both from Davis county.) I think we've struck a pretty good balance here in Jerusalem of indoor/outdoor activities, but I'm getting off the point. 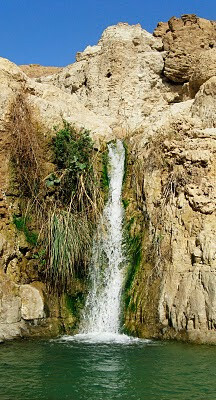 On Thursday we took a bus out to Ein Gedi and hiked through the wadi (dry stream bed, crevice thing) that was covered with plants and waterfalls and little pools to swim around in. At the end, David's Waterfall, you head up the escarpment to the tops of some pretty impressive mountains. 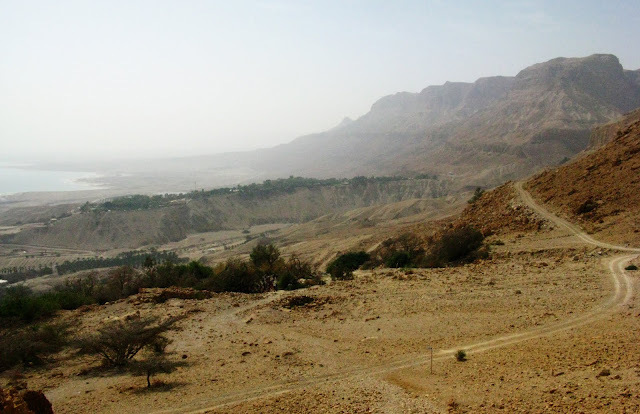 The views were amazing, and the different betwee the dusty mountains and the lush wadi floor even more amazing. That is Ye olde Dead Sea in the background of the picture above the remains of a 5000 year old temple. 5000 years old! We sweated, hiked, swam, sweated, and swam some more. We packed bloated sandwiches of tomato, roast chicken, avocado, and hummus and nearly lost them during a lunch break to hungry rodents. Speaking of potentially hazardous animals (nature, what gives!?) when we were swimming in this little pool Max noticed a good sized crab climbing up behind the waterfall. Maybe 6 inches in diameter. We were a little nervous for our bums after that point. 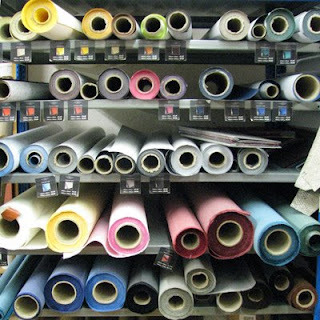 A Real Bookbinder in a Real Shop! Last night I had my first bookbinding lesson with a real bookbinder I found here in Jerusalem. He has worked for libraries in conservation and also works as a book artist. He has made books for The Queen (THE) and The Pope. He's pretty serious. He had been wanting to start a class of 4 but was missing one student for months. I called him about two weeks ago and as I made the fourth student we started almost immediately. It's amazing to me how things have fallen in to place for me in many areas. 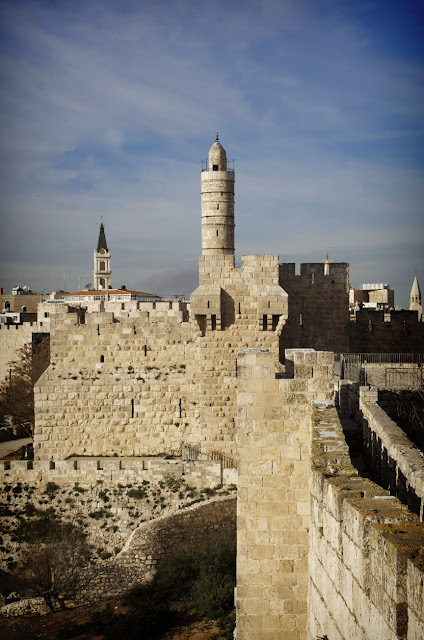 That's not to say that I haven't worked hard for them, or that hardships haven't come my way, but that I am so grateful for the areas in which things have worked out for us here in Jerusalem. In fact, this has answered the desires of my heart in many ways. I really wanted to train with a professional while I was here AND I have really been wanting to get to know local Israelis. 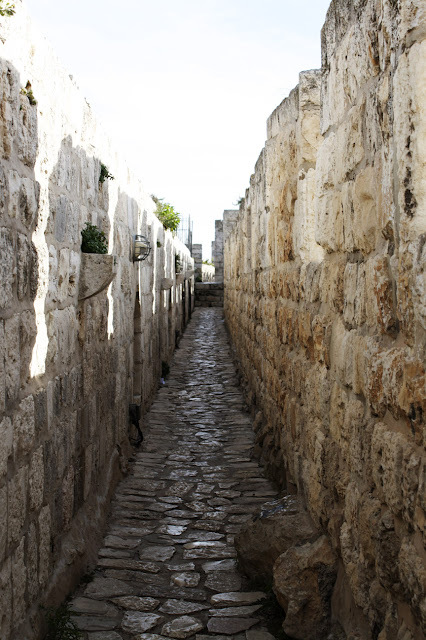 My experience with locals has been almost solely with Palestinians and I was feeling a little lopsided in my cultural education here in Jerusalem. This class is made up of four Israeli's (including my teacher)with very different experiences. One of the women is from Russia and is a paper artist. She told us that she had brokered a deal with her husband where she got to do whatever she wanted for a year and not think about making money. She recently worked in Judaicia, illuminating important Jewish documents, but now does beautiful artists books. The other woman is doing post doctorate work in neuroscience but is the artist in residence somewhere I couldn't understand and was too embarrassed to ask (you'll know why later). My teacher is from Canada via Germany (I think) and wears jeans with suspenders to class. He has a great sense of humor and has made lots of little gadgets to make bookbinding more efficient - some of which I will be the recipient of. Also, the bookbinding studio doubles as a brewery on the weekends if that tells you something about the awesomeness of the place. If it wasn't already obvious to our class that I wasn't local (the class is taught in English, but almost everyone speaks Hebrew as their native language) at one point our teacher was talking about the "shul", a word I had never heard before. I waited for a while to see if I would catch on from the context, but I couldn't quite figure out what he was talking about. Finally I said, "um, what's a shul?" And I felt at least one pair of eyes focus in on me, head titled to the side in wonder. I'll keep you posted on the projects we work on. I am mostly hoping to get rid of bad habits I've developed since my last formal class 4 years ago and pick up lots of new good habits. I'm just saying. If you were going to run an Arts and Theater language camp for Italian children, wouldn't you choose the Italian Riviera as your headquarters? Turns out SanRemo (pictured) is where our Italian Job (yeah, I said it) will start this summer. We will spend a week there and then two weeks somewhere else yet to be determined. Most of the locations are in the north, with Rome being the most southern. My vote is either a small Umbrian village close to where St. Francis of Assisi did his thing, Tione de Trento or Trent, as in "The Council of", or one very northern town on the border with Switzerland. We wouldn't mind going back to Florence either...and really, anywhere would be amazing. I realize that, don't worry. In other travel/Italy news, my latest discovery on the world book tour is the Rock Drawings in Valcamonica, Italy. In this most northern region of the Lombardy you can find one of the largest and best collections of prehistoric petroglyphs. I'm trying to steer our summer stopover in Italy to the north so that we can see these caves. 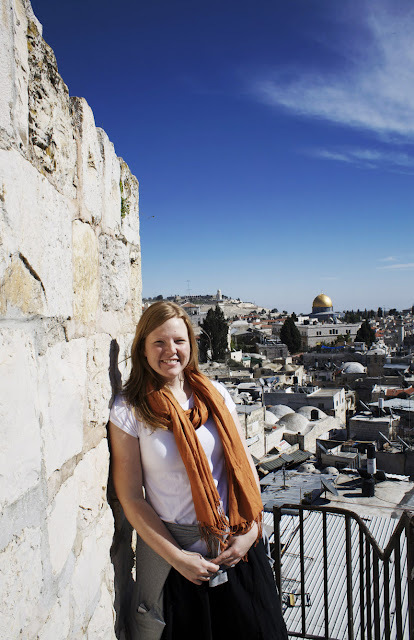 It was really eye opening to see Jerusalem from so many different vantage points. There are more recreational centers (read: basketball courts and soccer fields made of dirt) than you might think. We both wanted to die at the end, the walk being more like a miles and miles long scruffle up and down VERY steep staircases for 4 hours, BUT it was well worth it. Oh, vanity of vanities! I made my friend take this picture because I'm hardly in any pictures I've taken around Jerusalem. I like to place myself at the scene of the crime, as it were, for future generations. It might seam gross to cook meat on a spit all day while fat dribbles down over it, then cut hunks off with a blade attached to what is essentially a drill, stuff it inside of a Pita and cover it with cabbage, pickles, lettuce, tomatoes, cucumbers, hummus, tahina, and spicy sauce...but it's the most amazing thing. 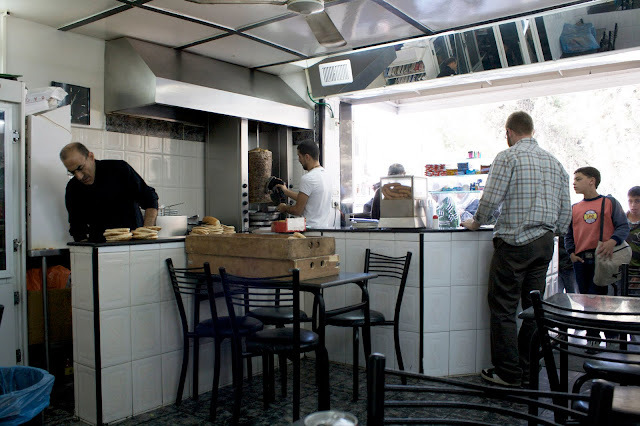 I am a burger girl and while I haven't found anything here that measures up burger wise, a good shwarma will do the trick every time.